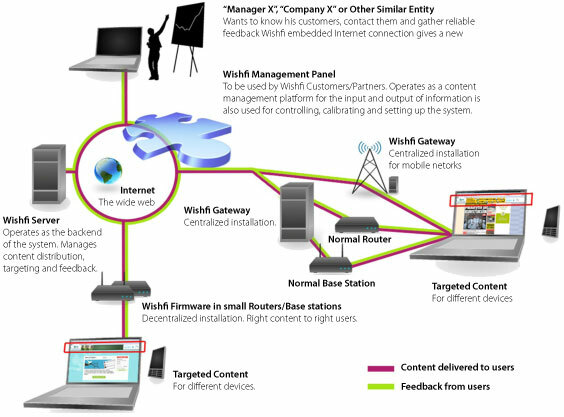 The Wishfi system works through Wishfi Gateways embedded network appliances throughout a customer’s network. Whenever a user opens a browser session within a customer’s network, the Wishfi Gateway detects URL requests as they are sent out. When the agent detects these requests, it sends its own request to our external content server, the Wishfi Publisher. Based on the identity of the Wishfi Agent, the Wishfi Publisher will send content to the Wishfi Agent. This content is then rendered in the browser page along with the original requested content. Wishfi can be deployed on a central server/bridge hosted in a network operations center or distributed in routers or gateways at premise based network or end user locations. The Network owner can configure Wishfi to allow the end user to opt out of the MediaSpace or have it locked in place and be present where ever the user navigates on their browser.